Adding images to your posts can be frustrating. Nothing seems to fit and sometimes the size is so small it seems useless. Let’s fix that. For now I’m going to assume (yep, there’s that word) that you already know how to upload photos and get them into your media library. If enough of you say “No, in fact, I don’t!” we’ll cover that in another post. First Pro Tip #1: Don’t add your pictures before the words. It’s putting the old cart before the horse and it will actually make it harder to put your words and your pictures together in a manner that’s easy to manipulate. 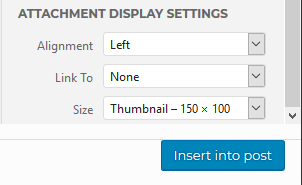 Place your cursor where you want your picture to go before hitting the Add Media button. 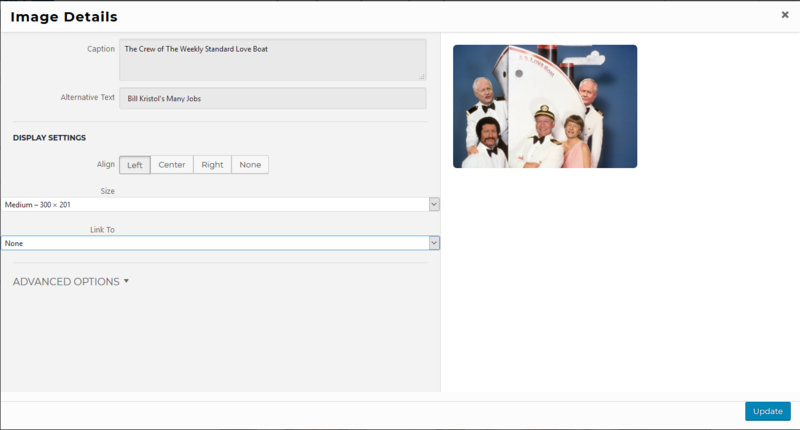 Hitting it will take you to the menu where you can upload or select pictures from your media library. 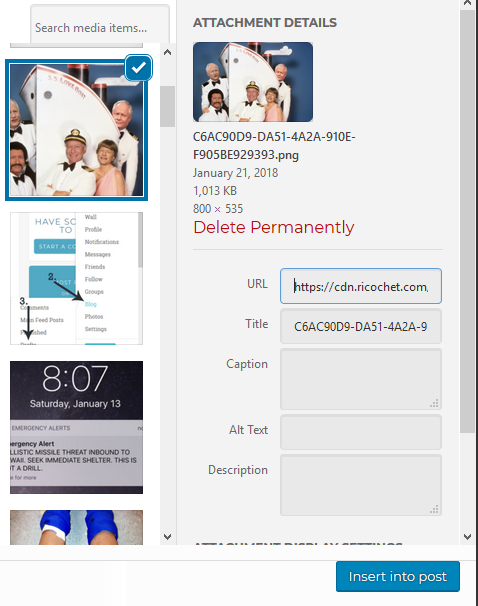 (Just drag an image from your computer and drop it into the media library to upload it. How long it takes to upload depends on your own internet connection, so be patient if necessary.) Click on the pic you wish to use and a blue check mark will appear in the corner and you’ll see a thumbnail of the pic in the righthand sidebar. Here’s where it gets tricky. DO NOT hit the Insert into post button yet! There’s a scroll bar there because there’s a lot more at the bottom of the window that is hidden from view. Here are your size and alignment dropdown menus. 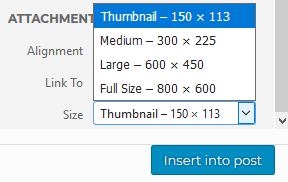 The killer is that the default setting is “Thumbnail.” Thumbnails are NOT your picture. They are tiny representations of your picture generated in the upload process. Try to resize a thumbnail and it will become ugly and blurry looking. When I see them in your posts it makes me drink a lot of adult beverages. For me, for my family and the liver they depend on, do not insert thumbnails into your posts. On the bright side, once you change the options it should stay changed. Depending on the size of the original it will give the option of choosing a Medium, a Large or a Full Size rendering. You won’t be locked into this size and you can adjust it once you see how big it actually is. OK? Now hit the blue button. Go ahead. Do it NOW! Holy crap, that’s HUUUGE! So let’s click directly on the picture. That’s going to generate two options. In the image below you can see both an edit menu in the center and white boxed drag points in every corner of the picture. If you’re happy with the alignment you can use your mouse on one of those drag points to resize the picture to whatever pleases your eye. However, you should only ever drag the corner to make the image smaller. If you make it larger, particularly if you’re starting with a thumbnail, the image will become blurry. The edit menu provides four alignment options here: Left, Center, Right, and None. Never chose the last one. That can create a picture that is unanchored. 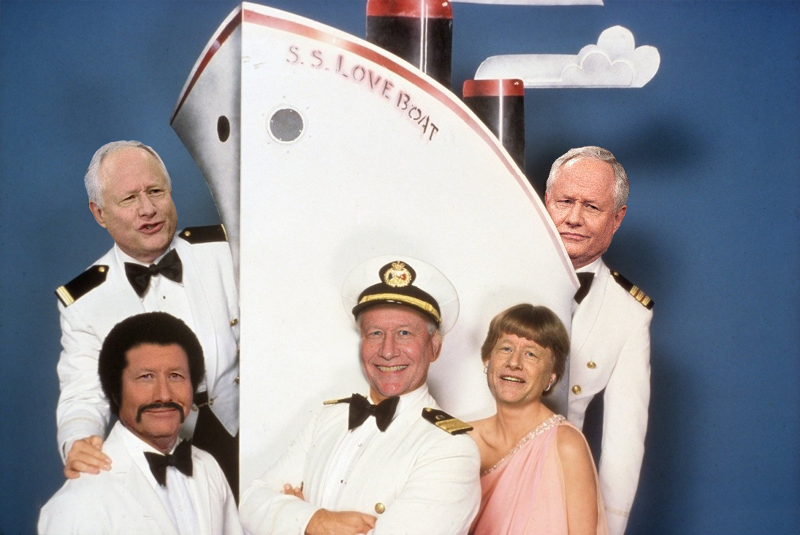 Despite what Sally Fields thinks, nobody really, really likes The Flying None. Or for more functions you can click on the fifth choice, the pencil icon. This will give you another menu labeled Image Details. Here you can add a caption that will appear in a lighter grey font under the picture. Again there are options to chose the alignment and a dropdown menu to size. There is a place for alternative text but as of this writing it is inoperable. 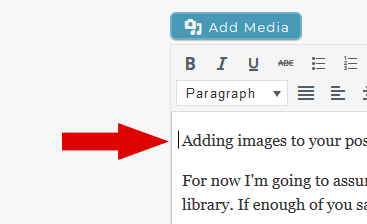 If it were functioning you would see what is typed in that box when your cursor is on the picture in your published post. And by the way, you will have noticed that when you originally added the picture to your post you could have added your caption at that point. But since we were concentrating on not having premature insertion with an unsatisfactory result I felt there was no need to distract you. There you have it. Align yourself and resize to your heart’s content. Pro Tip#3: Almost forgot something… If you go back and edit a piece after it has been published and you choose to do your editing on an iOS device such as an iPad, your picture alignment may be lost and your caption may end up in the body of your text. It’s safer to edit on your desktop or laptop. Disclaimer: No Bill Kristols were harmed in the production of this post. It’s all Photoshop Magic.